Andrea Bocelli (center) and his son, Matteo, attend the U.K. premiere of Disney's The Nutcracker And The Four Realms on Nov. 1, 2018, in London. "For me it has been a terrible experience because I felt all the responsibility, you know," Andrea says. "I am very worried because I know every kind of difficulties, every problem." Father and son sing a duet on the song "Fall On Me." Though Matteo is still a student at the Conservatory of Lucca in Tuscany, Italy, this new song marks the beginning of his professional singing career. But the son isn't worried about the reputation that precedes him or his famous father. "For me it's not intimidating at all," the younger Bocelli says. "He's a big help and I have him 24 hours a day. And so I have the possibility to ask him questions about singing." Helping his son embark on a career in music comes naturally to Andrea. "The only thing I can say is he has the spirit [and] a good expression when he sings," the father explains. "The expression is the only thing that's impossible to learn." Aside from the duet with Matteo, the new album features guest performances from Ed Sheeran, Aida Garifullina, Josh Groban and Dua Lipa. Andrea says British pop star Lipa worked very hard to understand the hidden message behind the scoring of their duet, "If Only." "Every song has a secret language," Andrea says. With more than 20 years of stardom under his belt, the elder Bocelli still appreciates that he can travel the world performing. He also appreciates that he can introduce new generations to his music — whether popular or classical. "People don't have many opportunities to discover this kind of music," Bocelli says. "But when you can do it, usually, it remains completely ... enchanted." There's no voice quite like that of Andrea Bocelli. ANDREA BOCELLI: (Singing in Italian). KELLY: "Con Te Partiro" - that's Bocelli's hit from 1995. It cemented his status as one of the world's most beloved singers, one who has since collaborated with everyone from Celine Dion to Ariana Grande, one who's earned a Guinness World Record for simultaneously holding the No. 1, 2 and 3 spots in Billboard's classical top 10. Andrea Bocelli sings pop. He sings opera. On his new album titled "Si," he tries something new, something he finds truly daunting - singing with his 21-year-old son Matteo. A BOCELLI: For me, it has been a terrible experience (laughter) because I felt all the responsibility, you know? And I am very worried because I know every kind of difficulties, every kind of problems. MATTEO BOCELLI: He knows that he's had tough way. 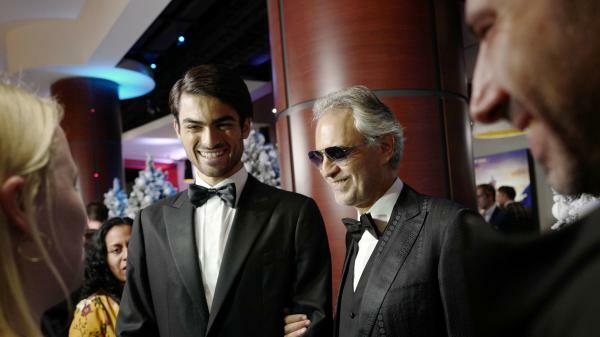 KELLY: That's Matteo Bocelli and his father, Andrea Bocelli, talking about their song "Fall On Me." I talked to them both with the help of a translator about what it means to record together. M BOCELLI: (Singing) Fall on me with all your light. KELLY: So, Matteo, this for you is the beginning of a career. This is not just a fun project with Dad. A BOCELLI: No, now is not the beginning. For now, it's rehearsal, something (unintelligible). M BOCELLI: Yeah. At the moment, I'm just a student of the conservatory of Lucca trying to get the best technique I can. KELLY: Lucca, we should explain, is the beautiful walled town in Tuscany. KELLY: I have to ask, Matteo, does it help or is it completely intimidating to try to launch yourself in this business with Andrea Bocelli as your dad? M BOCELLI: Honestly, for me, it's not intimidating at all because, I mean, I see him as a father. And he's - let's say that he's a big help because I have him 24 hours a day, and so I have the possibility to ask him a question about singing, about the technique, so it's a help. KELLY: And, Andrea, for you, watching your son launch himself into this business, you said how worried you are and how frightening that can be because you know this world, but there must also be such pride knowing that he's going to come along and that generations from now, there'll still be a Bocelli singing. KELLY: And what do you mean by expression? A BOCELLI: The way you can communicate the feelings, you know? Then, of course, the road is very long and very tough. He has to study a lot because day by day, we - me too. I am 60. And every day, I try to be better, to discover something new in my instrument. ANDREA BOCELLI AND MATTEO BOCELLI: (Singing) Fall on me with all your light, with all your light. KELLY: Yeah, Andrea, you know, from the outside, somebody could look at you and it looks as though you've made it. You lived this charmed life. You pack stadiums all over the world. Do you still feel pressure putting yourself out there with new work, new album? A BOCELLI: I suffered a lot in my life for this because I am very (speaking Italian). A BOCELLI: Emotional, yeah. Now I am a little bit more tranquil when I go because I'm convinced I've done all my best in order to be perfect shape. A BOCELLI: (Singing in Italian). KELLY: Another duet on this album, which surprised me, was with Dua Lipa, the British pop star. She's 23. She's not the most obvious person for a - you said you were 60 - 60-year-old world-famous Italian tenor to put - to record with. A BOCELLI: No, but - she's young, but her voice is very inspired. She did really her best in order to understand the score. DUA LIPA: (Singing) If only we could turn back time, take back the day we said goodbye, maybe your heart would still be mine. ANDREA BOCELLI AND DUA LIPA: (Singing) My love, if only (singing in Italian). KELLY: And you said she worked to understand the score. Walk me through that. A BOCELLI: Every song has a secret language, you know? And you have to understand it. KELLY: So for this song, what's the secret message? A BOCELLI: It's impossible to explain. It's secret. It's (speaking Italian). KELLY: You just have to hear it and get it. Is that what you're saying? A BOCELLI: Yes. There is a very interesting expression coming from a very famous philosopher about the music. I say it in Italian, then Angela (ph) will translate for you. ANGELA: He says that music is the hidden, rhythmic practice of the spirit that has no number. KELLY: That is cryptic (laughter). ANDREA BOCELLI AND DUA LIPA: (Singing in Italian). KELLY: I've been trying to keep up with your U.S. tour on Twitter, and it looks amazing. City after city after city - the number of people who come to hear you sing. And I wonder, what do you think is going on there? Does this speak to an unmet desire for classical music? A BOCELLI: I think that classical music - it's something like a paradise of music, you know? People don't have many opportunities to discover this kind of music. But when you can do it, usually remains completely (speaking Italian). ANGELA: You're enchanted. It stays with you. KELLY: You've talked about doing the work, that you show up, you sing, you do the work every day. What do you still want to do, having done so much by the age of 60? A BOCELLI: Well, to sing for me is not so hard. It's my job, but it's also my passion. For me, it's much more difficult to speak English for example. KELLY: This conversation is more challenging than entertaining is to you. A BOCELLI: An interview like this for me is much, much more different than a concert at the Madison Square Garden. KELLY: ...And for speaking English and sharing this beautiful music with us. KELLY: We appreciate it. Andrea Bocelli and his son, Matteo Bocelli, both speaking to us from our New York bureau about the new album on which they collaborate, "Si." A BOCELLI: (Singing in Italian). Transcript provided by NPR, Copyright NPR.